The 911 has definitely been the most successful Porsche ever since the first model came into existence back in 1963, and as proof of that the 911 won the fifth place in the 1999 Car of the Century award. The German sports car manufacturer carries the legacy forward with the new Porsche 911 Carrera S 2013, boasting some styling changes and improvements compared with the previous model. At the back of the Carrera S resides a 3.8 liter boxer flat-six engine that develops 400 horsepower and 325 lb-ft of torque, which translates into a 50 horsepower and 38 lb-ft of torque increase when compared to the standard 911. The rear wheels are motivated through a 7-speed manual transmission as a standard, whereas a 7-speed PDK gearbox is available as an option. Performance-wise the 7-speed PDK equipped Carrera S has a top speed of 188 mph is able to go from 0 to 60 in 4.3 seconds, but thanks to the optional Sport Chrono package the acceleration is improved to 4.1 seconds. That's not bad in a straight line, but how about cornering? Well the new Carrera S features Porsche Dynamic Chassis Control which increases the stability and greatly reduces lateral inclination. 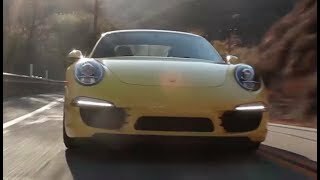 Furthermore, although the 911 Carrera S is without a doubt a sports car that craves speed and excitement, Porsche does not overlook fuel efficiency and carbon dioxide emissions. As a result the new model produces 16 % less CO2 than the previous model and the fuel consumption has been improved with the help of a start/stop system, electrical system recuperation, thermal management, a new electro-mechanical power steering and indeed the 7-speed gearbox which allows driving at higher speeds with reduced fuel consumption. In terms of aesthetics and exterior design the new Carrera S has not been heavily modified at first glance (which comes as no surprise really), but a trained eye will notice that in fact the new model differs greatly from the previous one. First of all, the wheelbase has been increased by 3.9 inches, the roof has also been lowered, and in addition the new model comes with a selection of 20 inch wheels. The front end of the car is probably the least modified in terms of aesthetics, but at the back there's a whole other story. The new model has been fitted with completely redesigned tail lamps and a new rear bumper. The interior of the new Carrera S also undergone major changes and it now shares many similarities with the Carrera GT and the Panamera. Although the interior design is fresh, classic Porsche elements are still to be found, such as the instrument cluster. 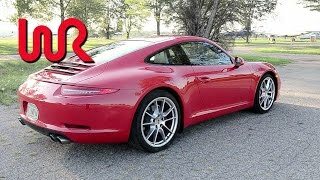 Price-wise the new Porsche 911 Carrera S 2013 has MSRP of $96,400 which is about the same price as a Nissan GT-R 2012, but far less expensive than the $118,650 Aston Martin V8 Vantage 2012 or the $114,200 Audi R8 2012.